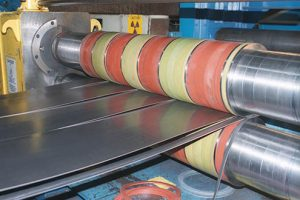 Slitting lines are used for processing coiled metals into precise width smaller coils or mults for resale or further processing. Slitting lines typically incorporate a number of machines to allow for easy processing of material strip. Element Machinery has supplied slitting lines to handle 0.005″ (0.13 mm) to 0.625″ (15.9 mm) and strip widths from 24″ (635 mm) to 120″ (3048mm). A looping slitter is the most common slitter for slitting of light gauge materials and narrow widths (also known as mults). A pull through slitting line is used by decoupling or allowing the slitter motor to free spin and slitting material by pulling it through the knives with the recoiler drive. A drive assisted slitting line is designed so that the slitter drive is used to help push material through the downstream process.